A good technician is your “best friend” if you have Termites. Varsity Termite technicians are trained in the latest and very best termite treatment methods. At Varsity Termite Control we are a family run company that puts customers first. The customers are our top priority. We strive daily to be the best company we can be – going the extra mile for our customers’ needs. We provide convenient, local termite protection Valley Wide – from Phoenix, to Scottsdale, to Mesa, down to Maricopa and more. Only the latest and very best products are used. We treat your home like it’s Our Own! Varsity Termite and Pest Control is about relationships. We want you to feel great about your choice for your pest control needs. These little critters cause billions of dollars in damage each year across the country. Arizona unfortunately is not exempt from them. More often than not, standard homeowners insurance does not cover termite damage, so it is wise to be proactive in getting professional help regarding termite control and removal. Both the monetary drain and the thought of thousands of winged termites emerging inside your home can be very stressful. While termites primarily feed on wood, they also damage insulation, paper, book, and even swimming pool liners and filtration systems. When buying or selling a home, the issue of termites becomes especially important as the sale is normally conditional on a termite inspection/infestation report. How will I know my home is infested? Discovering winged termites indoors almost always indicates an infestation whichwarrants termite treatment. Ants are often confused with termites, which often swarm at the same time of year. You can tell the difference as termites have straight antennae, uniform waist and wings of equal size (ants have elbowed antennae, constricted waists and forewings that are longer than the hind wings). Evidence of mud tunneling in, under, and over foundation walls, support piers, sill plates, floor joists, etc. is a clear sign of subterranean termites. These mud tubes are typically about the diameter of a pencil and can sometimes be thicker. Varsity advises for removal of mud tunnels and cellulose debris by a professional termite control company. Wood that is damaged, has dark or blistering surfaces, or is very thin and easily bendable or breakable may also be a sign of drywood termite infestation. Termite-damaged wood is usually hollowed out along the grain, with bits of dried mud or soil lining the feeding galleries. Wood damaged by other insects such as carpenter ants or by moisture will not have this appearance. A termite inspection is recommended. When it comes to termites, “out of site” does not always mean out of mind.” Often times there will be no visible indication that a home is infested. Termites are cryptic creatures and infestations can go undetected for many years, hidden behind walls, insulation, floor coverings, etc. They can tunnel hundreds of feet just to reach a home or feeding site. Signs that you have a termite infestation are often difficult to spot. 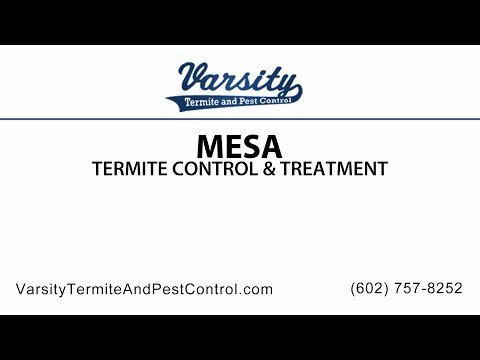 Call Varsity today – your locally owned Arizona based company, for a free termite inspection! Termite Treatment – can I take care of it myself? Unfortunately “Do-It-Yourself” products seldom eradicate an existing termite problem. Special skills are required when ridding a home of these pesky creatures. Knowledge of building construction is needed to identify the main areas where termites are likely to enter. Even when identified, many of these entry points are hidden and difficult to access. Termite protection companies utilize special equipment such as masonry drills, pumps, large-capacity tanks, and soil treatment rods. They also employ such methods as the Sentricon elimination system to effectively remove all hints of subterranean termites from your property. In short, termite treatment is a job best left for professionals! Varsity serves the Phoenix and greater areas with its expertise in termite control! Call us today and let us help you take your home back! Any tips on preventing Termites from entering my home? Call us today for a Free Termite Inspection and find out why many of your Arizona neighbors in the Phoenix and Greater Area trust Varsity for their termite control needs.